The film Heart of Stone has taken the Best Film prize at this year’s edition of the One World festival of human rights documentaries in Prague. The winning documentary is about an Afghan refugee in France. The Best Director award went to Denmark’s Mads Brugger, maker of Cold Case Hammarskjold. And there is an award-winning Bahamian film “Cargo” which is being shown in cinemas: At the age of 9, Bahamian writer/director Kareem Mortimer saw haunting images of the bloated bodies of Haitian would-be migrants washed up on a beach. Apparently they were trapped and locked in the hold of a ship by a smuggler who did not have the decency to set them free. It was this experience that inspired him to make the drama/thriller feature film Cargo. The film previously debuted in Aruba, Bahamas, Barbados, Curacao, Jamaica, Guyana, Grenada, Suriname and St Lucia and will be released in the Trinidad, US and Canada in the summer. It has won five awards: Best Feature, Silicon Valley African Film Festival; Bahamian Icon Award; Best Film, Haiti International Film Festival, Los Angeles; Trident Award, Barbados Independent Film Festival; and Amnesty International Human Rights Prize for Film, TT Film Festival in 2017. 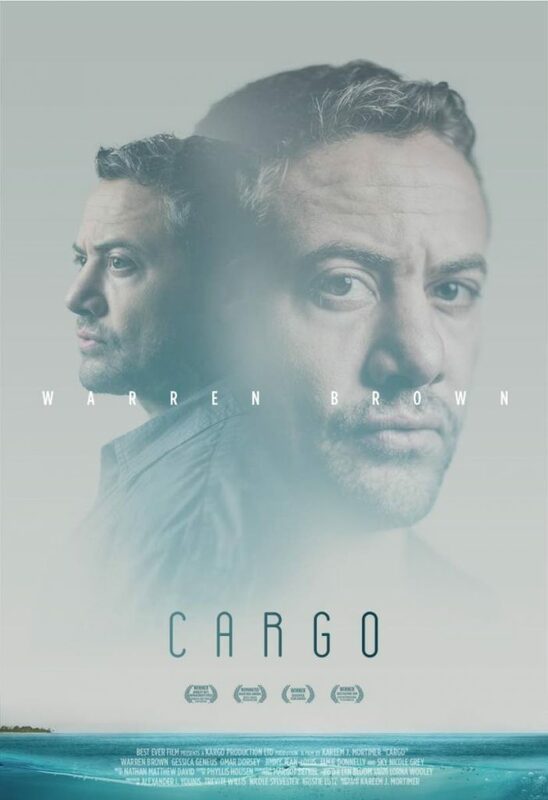 The poster for the film Cargo. So the likelihood that tomorrow – 24 February – one or more are included in the final nominee list is pretty high.Here’s a quick guide to the five HRWFF title that made the short list. Working with local journalists and spending more than three years with communities in Baltimore, Maryland, has made for one of the most unassuming films we have seen on policing and racism in the U.S. This brilliant film was directed by Marilyn Ness (who produced E-Team, a film featuring Human Rights Watch researchers working in crisis situations). A hauntingly beautiful film, The Distant Barking of Dogsby Simon Lereng Wilmont embeds the viewer into the lives of two young boys growing up in eastern Ukraine on the conflict’s frontline. The film captures the boys’ diminishing innocence in the midst of war, while bringing to the fore the most basic human rights of life, liberty, and security. Filmmaker Bing Liu shares a coming-of-age story shot over 12 years in Rockford, Illinois, where he captured footage of himself and two friends, young men bound by a love of skateboarding and the desire to escape volatile family life. The film grapples with the cycles of shame and abuse in a town with some of the highest rates of domestic abuse in the U.S. While navigating a relationship between his camera, his friends, and his past, Liu weaves a rich and epic story while remaining intimate and immersive. Almudena Carracedo and Robert Bahar’s film has won awards around the world, shedding light on a dark era of Spain’s history that haunts it to this day. Under General Francisco Franco’s rule, it is estimated that 100,000 people were disappeared and murdered. With its “Amnesty Law,” Spain prohibited legal recourse by survivors and families. The film follows brave people, assisted by others navigating international criminal processes in Chile and Guatemala, as they break the silence and seek justice. Are you into screening films on human rights in Africa, Asia, Eastern Europe, Latin America or the Middle East, and would you like to learn more about programming, organisational matters and attracting new audiences? Then apply for Cinema without Borders, a workshop and networking programme on how to organise a human rights film festival. The five-day programme, which takes place during the Movies that Matter Festival 2019 in The Hague, brings together starting and more experienced film festival professionals from all over the world. See call for proposals here. Human Rights Films: call for action or entertainment? Daniel Warner, who until recently was the Chair of the True Heroes Films (THF) in Geneva, runs a weekly blog in English for the Tribune de Geneve, He often touches on human rights issues and this time (20 March 2018) addresses an important question: to what extent are human rights films a (effective) call for action? The 1972 photo of a young girl running naked in Trang Bang screaming in pain from the effects of napalm had a profound influence on the public’s perception of the horrors of the Vietnam War. The 2015 photo of a three-year-old refugee boy drowned in the Mediterranean Sea in Turkey also had a profound influence of the public’s perception, this time on the desperate plight of millions of refugees. The images of Phan Thi Kim Phuc and Aylan Kurdi are iconic representations. Both capture larger stories; both images express powerful narratives. Visualization is story telling in another form. ……Marshall McLuhan in the 1960s introduced the notion that the medium of communication – movies for instance – change how a message is perceived. Directors can alter time sequences; background music can play directly to our emotions. We have entered new forms of communication that are just beginning to be understood. The recent Geneva International Film Festival and Forum on Human Rights was a significant event; 61 films shown in 57 venues in the Swiss Romand and Grand Genève, 28 debates and discussions with important figures such as the United Nations High Commissioner for Human Rights and the Catalonian leader Carles Puidgemont as well as a human rights film tour organized by Swiss embassies in 45 countries. …The images were shocking, almost numbing. We in the theatre became more than viewers, we became indirect witnesses through the lens of the film. Several directors participated in debates following the presentations. They all expressed hope that the revelations shown on the screen would encourage reaction from the audience beyond the theatre. The purpose of the film, many argued, was to move the attendees and future viewers from watchers – i.e., indirect witnesses – to activists. The films, according to their creators, were calls to action. McLuhan is most pertinent here. Watching a movie, any movie, is passive/emotional. The director leads us through what he or she wants us to see and feel. We are being literally directed. At a human rights film festival, we are directed, made aware, and called to action. The message of the medium is more than just perception; it is a motivation to do something. But the screen is just a screen, and a silver screen at that. The films were expertly produced. Most were technologically impressive. The cruelty and crudeness of human suffering were presented with all that modernity could offer. It is the contrast between the rawness of grave breaches of human dignity and the sophistication of the current cinema that somehow reduced the power of the message. If, according to McLuhan, the medium is the message, then the films themselves – with all their slick professionalism – somehow played against a call to action. The excellence of the films was in contradiction to the cruelty and chaos of what they were showing. .. Human rights activists are turning to visualization to appeal to larger and larger audiences. Visualization is today’s most powerful means of communication and it is becoming more and more sophisticated. The object of human rights’ film makers is to get the message out to the largest audience in an appealing way. The written era of Gutenberg is no longer hot. It is easier to teach students World War II by viewing Saving Private Ryan than to have them read weighty tomes of historical documentation. If the message of human rights’ films is to witness human rights violations and call to action, professional presentations may be counter-productive. Movies are fundamentally entertainment; however instructive they may be. But when it comes to human rights and their violations, there should be as little entertainment as possible. Movies that Matter presented the ten festivals that it recently decided to support. This month, it offered grants to a new round of projects. Among others, two debuting festivals that will receive the start-up grant: for the first time a human rights film festival will take place in Timor-Leste in 2018. To bring the cinema to the people, the Timor-Leste Human Rights Film Festival will use a portable set-up to screen their selection of films at multiple sites. A new film festival will also arrive in South Africa: Shining Lights onto Langa. The festival introduces people to the Sunshine Cinema, a solar powered mobile cinema that converts solar energy into social impact. It brings people together with the intent to uplift grassroots movements and create networks of social change. Additionally, the support goes to three film festivals that pay direct attention to LGTBQI+ rights in Turkey, Pakistan and Myanmar. Other supported cinema projects include those in Kyrgyzstan, Moldova, Palestine, Turkey and Peru. The increasing use of images in the human rights world seems unstoppable. One (small) feature is the organisation of local human rights film festivals. Movies that Matter has an International Support Programme that offers small grants to stage human rights film events in countries in Africa, Asia, Latin America, Middle East and Eastern Europe. To promote the screenings of human rights cinema worldwide, Movies that Matter zooms in especially on countries with limited resources and freedom of press. These events can take various forms, such as human rights film festivals, LGBT film festivals, mobile cinema projects, school screenings and grassroots distribution. Each year the grant programme has two selection rounds. Deadlines are usually around mid-April [NEXT DEADLINE 17 APRIL 2017] and mid-September. Movies that Matter judges every project on its individual quality. If you’re not sure whether your project fits within the criteria, please contact MTM at international (at) moviesthatmatter.nl. Please note that Movies that Matter does not support film production. Find an overview of possible resources for film production here.! Movies that Matter supports human rights film screenings in developing countries and countries where press freedom is at stake. Applications are welcome for mobile cinema projects, human rights film festivals, film outreach projects or other innovative cinema projects to stimulate the discussion on human rights, social justice and freedom of expression? a) start-up grants (max. EUR 7,500); and b) impact grants (max. EUR 10,000). The application deadline is 17 April 2016.